It begins in a manner that both boldly announces its intentions and introduces the sensitive intimacy that defines the film to come. After an opening intertitle that describes the following images as Johnson’s memoir of sorts, with the striking line “These are the images that have marked me”, Johnson cuts to footage of a Bosnian shepherd on horseback leading sheep. Without context, this shot in and of itself holds little tangible meaning, but Johnson (in the moment, as the cinematographer) unexpectedly breaks the camera’s line of sight, plucking a few blades of grass out of the way so she can better capture the sheep trundling down the path next to her. This, coupled with the next shot, as Johnson first gasps at a lightning strike she is filming and then sneezes, are perhaps the clearest sign of Johnson’s presence in actively changing the shot, but they come significantly just before the title card. Johnson’s primary concern in both the construction of Cameraperson and in her general cinematography seems to be one of sensitivity. Even though the most apparent signs of Johnson’s presence off-screen (for example, in the aforementioned shot changes) are confined to the first half, the viewer never loses sight of her active role in crafting the situations she is in. 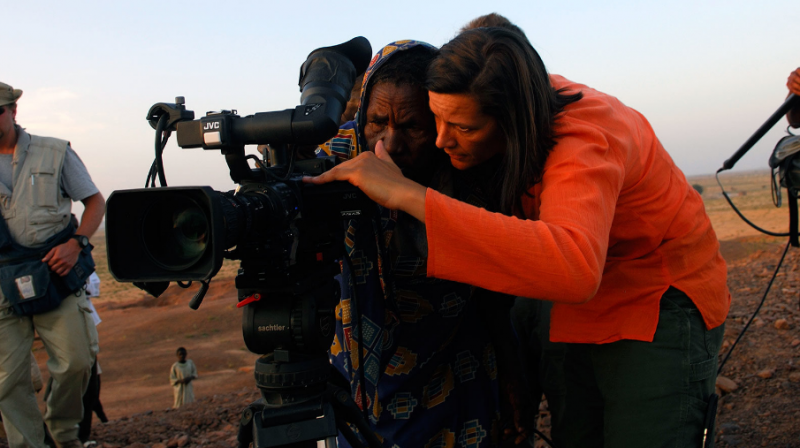 From her incisive but gentle questions to the often intimate framings, Johnson never gets so close as to be intrusive but always maintains the exact level of remove that is required, both in the footage she shot on assignment in some of the most traumatized regions of the world and in the “home movies” of the most seemingly inconsequential occurrences in day-to-day life. Here, perhaps, is the greatest point of divergence with Sans soleil, which conducts its dialogue with its subjects entirely through visual means. Marker seems to reject an overtly personal bent, seeking to diminish his directorial presence in favor of offering his vision of the world, whereas Johnson seeks to strike a more tenuous balance. Of course, there are many other differences. For starters, Sans soleil utilizes an extensive narration, supposedly made of letters written by a separate filmmaker. The letters (written in actuality by Marker) in turn both establish a level of remove and a partial explanation of the sometimes inexplicable images that are appearing on the screen. Cameraperson, on the other hand, forgoes this tactic. Though the images are never remotely abstract, Johnson never feels beholden to explain the context or even the original purpose of the footage, instead putting an intertitle stating the location where the footage was shot and the occasional chyron with the name and occupation of the person being interviewed. For me, this idea took some time getting used to. As I was expecting the whirlwind of information in Sans soleil, I felt slightly alienated by the stop-and-start rhythm of images that at first glance seemed to be banal and “ordinary”, and the locations seemed too disparate for Johnson to return to (in contrast to the localized repetitions of Marker’s film). But Johnson is operating in an entirely different mode of communication, one of astonishing patience and power. Aside from two essentially stand-alone montages, one of people walking and the other a stunning display of sites of massacres and murders from around the world, including such disparate locations as Ground Zero, a church in Rwanda, a school in Bosnia, and a truck in Texas, Johnson sticks to the vignettes of footage that, in some way, all come back to the idea of the shared humanity and its effect on the cameraperson. Johnson never lets the overarching themes become apparent, but in the little moments that rise out of everyday life, such as Jacques Derrida commenting on her tripping as she is filming him, or her capturing a sudden snowfall while she is shooting a woman whose mother killed herself, she makes it clear that the cameraperson is human, and that it is in some way her responsibility to capture humanity not as it should be, but as it is. Nowhere is this clearer than in the home videos of both Johnson’s children and her mother, who died of Alzheimer’s. In this showing of people both at the beginning and at the end of their lives, she makes a statement that is at once both universal and personal, and ties it back to other footage that surrounds it. For instance, she implicitly connects footage of a Golden Gloves boxer being comforted by his mother (one of the most notable examples of Johnson returning to footage) to her mother brushing Johnson’s hair in the only moment where she can be seen on camera. However, what may be the most striking is the extraordinary breadth of life that Johnson has captured. From a lecture in Queens to a Michael Moore interview to a premature baby being born in Nigeria, the subject matter and tone frequently change in a single edit, but the unmistakable vitality that Johnson brings out of her subjects and images remains constant. Johnson most frequently returns to a family in Bosnia that is recovering after the war there, and emphasizes both the injustice that has been done and the family’s will to live on. Cameraperson is an optimistic film that never shies away from the truth, and throughout, Johnson’s will to document is paramount. It is a noble thing to document all of this life experience, and the skill with which Johnson and editor Nels Bangerter have constructed this supremely monumental film is evident in every transition, every moment. Cameraperson is a great film in every sense of the word, and one that I’ll be grappling with for years to come.